Too many superhero movies get lost in the attempt to navigate years or decades of comic-book lore, bending and compressing time in ungraceful ways. Origins are belabored into feature-length exposition, only to spawn sequels where universe-altering events happen in a snap. Spider-Man: Into The Spider-Verse pushes both of these qualities to the extreme. It’s an origin story for fan-favorite Spidey alter-ego Miles Morales (Shameik Moore) that soon accelerates into a dimensional-colliding freakout where potential spinoff characters appear with dizzying speed. This sounds like a particularly ill-advised page from the abruptly torn-up Amazing Spider-Man series bible, the failure of which inspired Sony to lease its prize hero back to the Marvel Cinematic Universe. Spider-Verse has nothing to do with that most recent MCU version of the character, nor with the Andrew Garfield or Tobey Maguire iterations (though the latter gets plenty of quick-hit visual references). 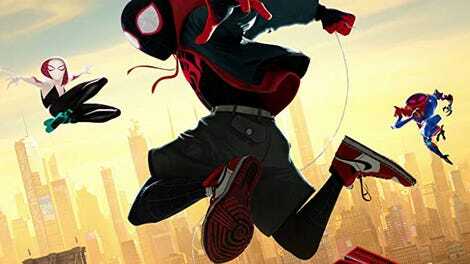 This is a separate, animated movie where Miles, a Brooklyn teenager having trouble adjusting to a fancy private school, is also bitten by a radioactive spider and gains supernatural abilities. When Miles meets the more established Spider-Man, it seems like Peter Parker might mentor him—until Parker meets a tragic end while trying to stop the Kingpin (Liev Schreiber) from ripping open a portal to other dimensions. It’s this portal that allows Parker to re-enter the story. In another universe, his Spider-Man is alive and well, albeit looking a little worse for wear. As befitting a Parker voiced by Jake Johnson, this is a very Nick Miller version of Spider-Man: a hapless (and grown-up) sadsack with stubble, bags under his eyes, and the clear beginnings of a pizza gut. The alternate Parker reluctantly agrees to work with Miles to stop the Kingpin, especially if he’s allowed to jump back to his own universe when they’re done. Soon they’re joined by a superpowered Gwen Stacy (Hailee Steinfeld) and several more variations on heroes with arachnid-based powers. Loyal comics readers may recognize these figures with fannish glee, while more casual appreciators of the character may find them pleasingly bizarre. The creative team is hybridized, too; the directing credit is split between animation veteran Bob Persichetti, storyboard artist Peter Ramsey, and Apatow associate Rodney Rothman, with a screenplay credit to Rothman and Phil Lord, who also produced the film with his creative partner, Chris Miller. Lord and Miller’s Lego Movie sensibility is all over the film’s breakneck pace and spitfire dialogue, along with touches of Brian Michael Bendis, the ace comics writer who created Morales and executive-produces here. Spider-Verse often feels like a weightier, more ambitious version of The Lego Batman Movie, but it’s not all irreverent wisecracks and goofball voicework (though its employment of both Nicolas Cage and John Mulaney as Spider-variants means its goofball work is also exceptional). The filmmaking itself is often witty, finding gags in whip-crack editing and shifts in perspective, like the virtual camera repositioning that allows two Spider-Men to appear upright while creeping up the side of a building. The climax, meanwhile, features perhaps the most sustained stream of psychedelia yet from a mainstream superhero picture. The emotional notes ring less loudly—or at least without the perfect clarity of the best moments from the Sam Raimi Spider-Man trilogy. Miles has affecting relationships with his cop dad (Brian Tyree Henry) and cool uncle (Mahershala Ali), alternate Peter Parker has some poignant MJ-based backstory, and the movie even gins up some empathy for the ruthless Kingpin. But put together, it’s a bit overbusy, sometimes obscuring the movie’s intriguing way of wrestling anew with those oft-repeated Spider-Man responsibilities. Miles, an instantly endearing character, doesn’t focus on the precarious juggling of his normal and superhero lives. He’s more concerned with the entirely fair question of whether an eager, goodhearted 15-year-old is prepared to shoulder superheroic burdens at all. That’s sort of what Spider-Man: Into The Spider-Verse is about, but in the end it plays more like a celebration of both insane comics continuity and the mutable nature of superhero identification. Characters endlessly derived from a single superhero power-set can be hackneyed, but when the movie bands a bunch of those characters together with a lead Spidey of black and Latino heritage, it’s making a convincing case for how familiar superheroes can refresh themselves when new faces take up the mantle. For that matter, it makes a cleverly self-serving case for an animated spin-off of a much-adapted character. This is the seventh Spider-Man feature film in 16 years, but this universe has rarely felt so fresh.